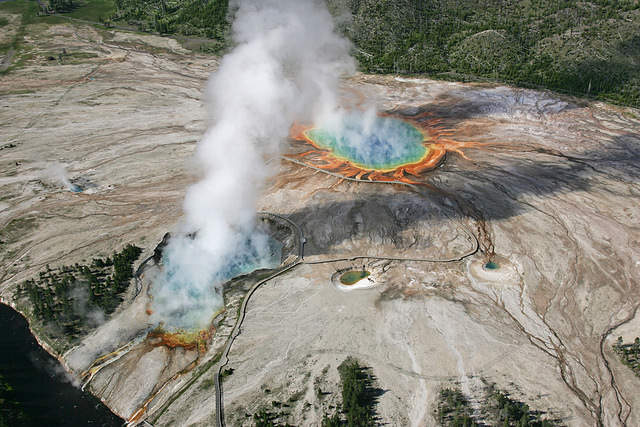 Truth time: some of Montana’s most incredible places are hidden in plain sight. One such example is the National Bison Range. 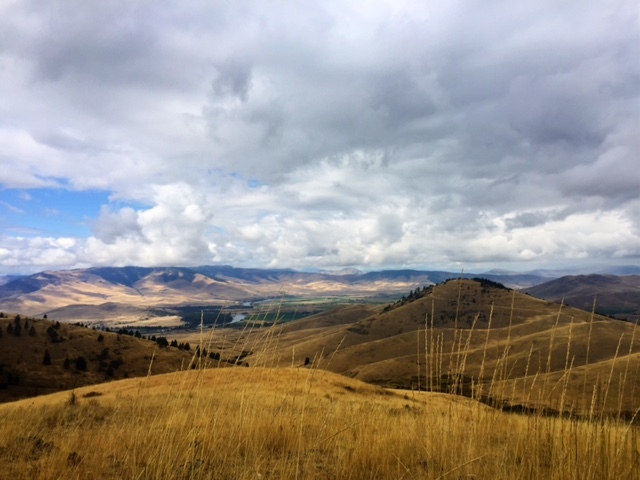 The National Bison Range is located in Moiese, Montana on a small mountain that’s connected to the Mission Mountains by a spur. 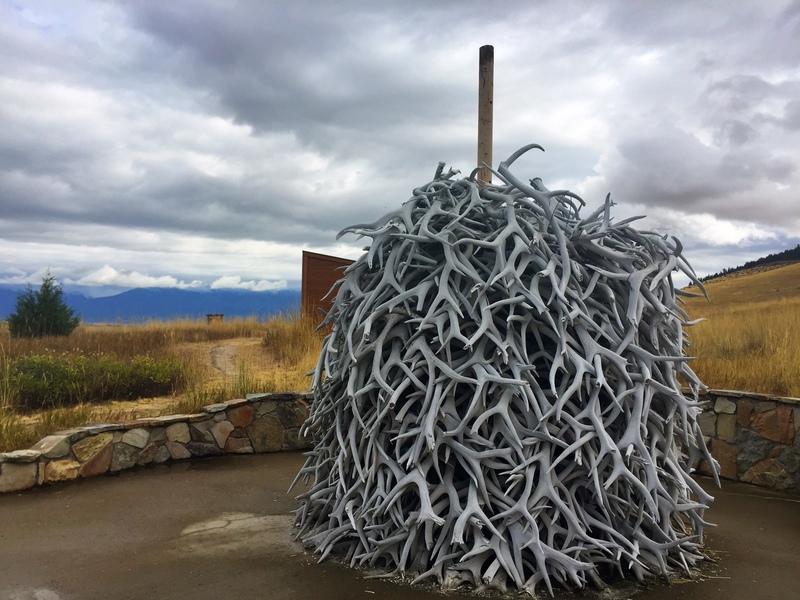 This pile of elk antlers, collected on the range, welcome visitors to the range and its visitor center. 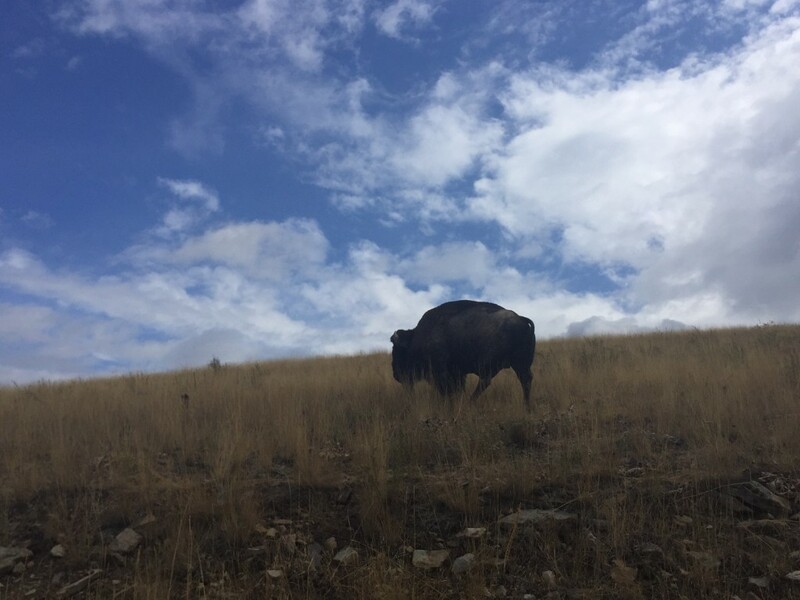 Located just off Highway 93 north of Ravalli, the National Bison Range has 18,500 acres of terrain that’s home to an estimated 350 herd of bison, as well as antelope, bighorn sheep, elk, deer, coyote and black bear. It’s also home to three scenic drives: Red Sleep Mountain Drive, Prairie Drive and West Loop. Since snowfall will soon close Red Sleep Mountain Drive, a gorgeous 19-mile-long one-way road (and one of my favorite drives in Western Montana) that takes visitors through the heart of the range, I grabbed a pal and we headed to the National Bison Range to make the drive before winter arrives. And while we could definitely tell that fall has officially arrived in Montana, it was such a beautiful day. 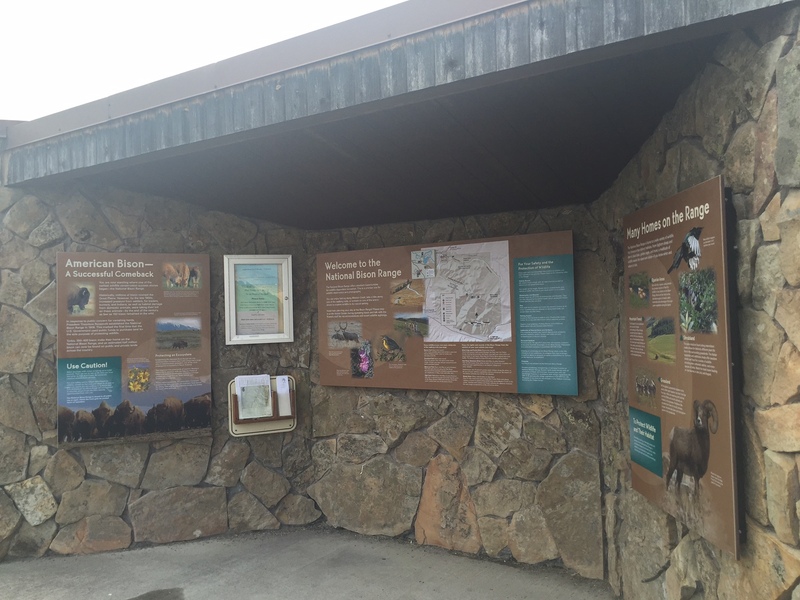 Welcome to the National Bison Range! The start of the drives: to the right is Red Sleep; to the left is West Loop. This guy slowly made his way along the road. After chowing on some grass, he started making his climb up the mountain. The view from the backside of the range on Red Sleep Drive. 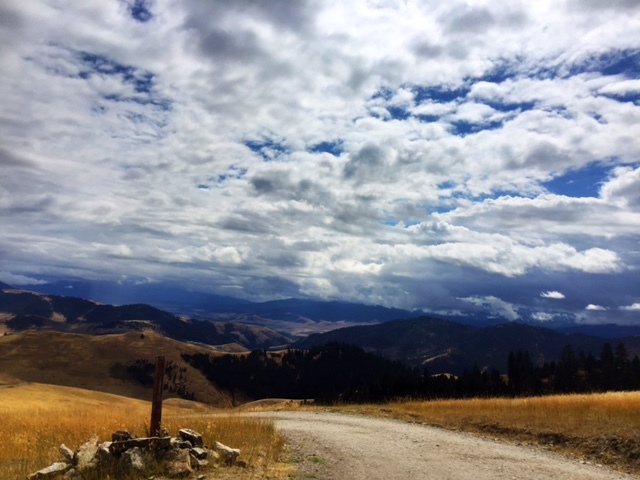 Early fall brings incredible weather patterns to Montana, resulting in this sky. This bison was taking a nap (I think). 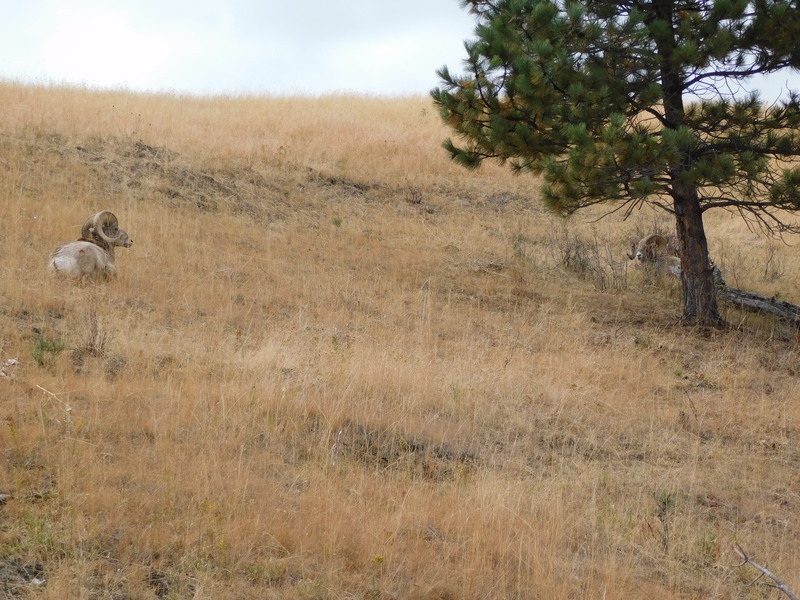 We saw several bighorn sheep along the drive’s route. 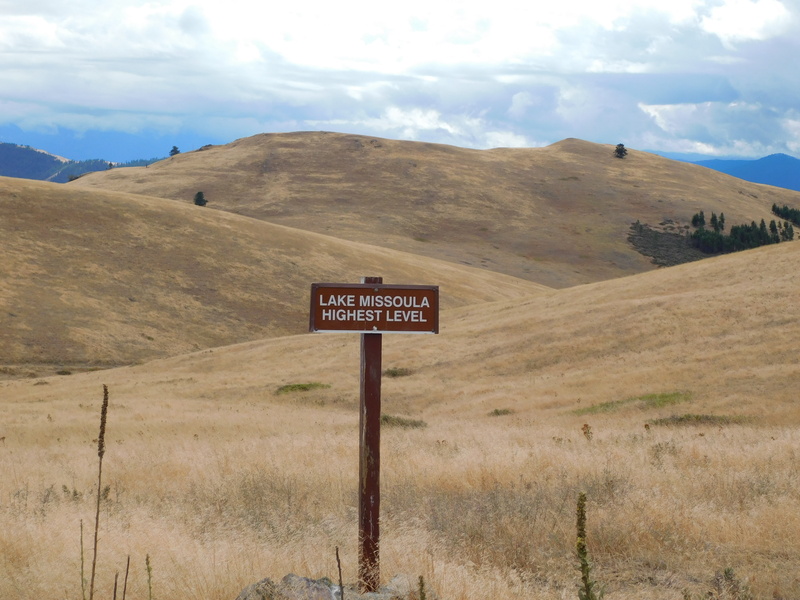 Driving through history and the highest water mark of Lake Missoula, a massive prehistoric lake that covered this area 15,000 years ago. This buck’s antlers were velvety gorgeous. He also did a great job blending into the landscape. 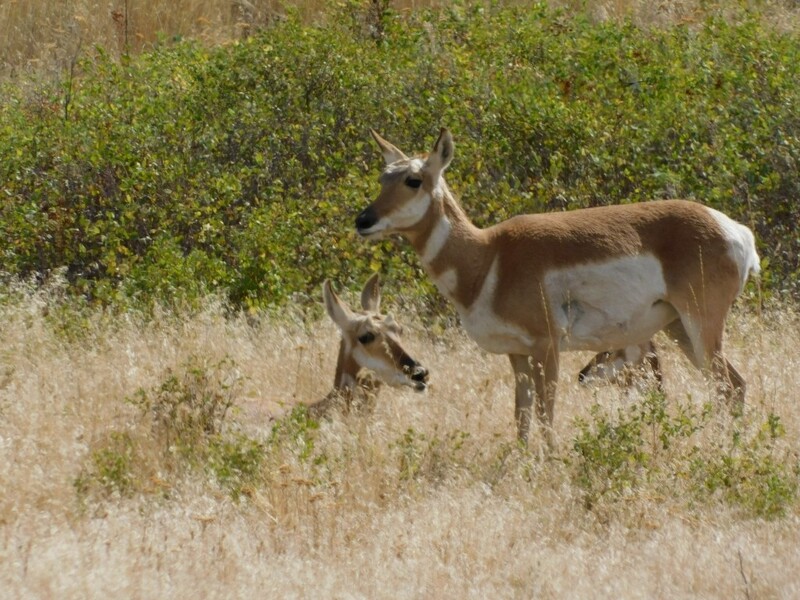 Some antelope, trying to blend in. They stood there totally motionless. After seeing a handful of bison along Red Sleep Drive, we saw this massive herd as we were getting ready to leave. 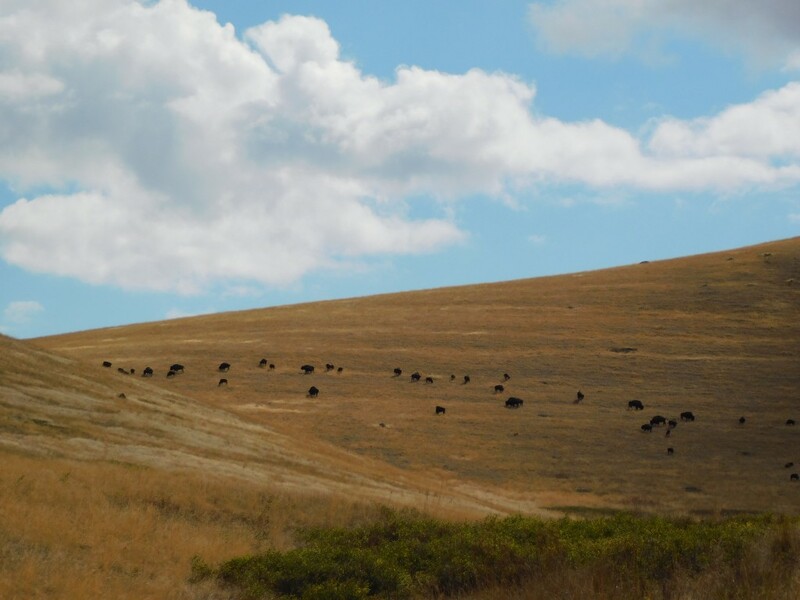 -The bison range is open year-round and each season offers a chance to view wildlife. -There are three drives on the range: Red Sleep Mountain Drive (open mid-May to early October), West Loop and Prairie Drive. Both West Loop and Prairie drive are open year-round. Learn more about all three drives here. -Vehicles over 30 feet long are not allowed on Red Sleep Mountain Drive. -The National Bison Range is an ideal location for viewing wildlife and remember that they are most active at dusk and dawn. 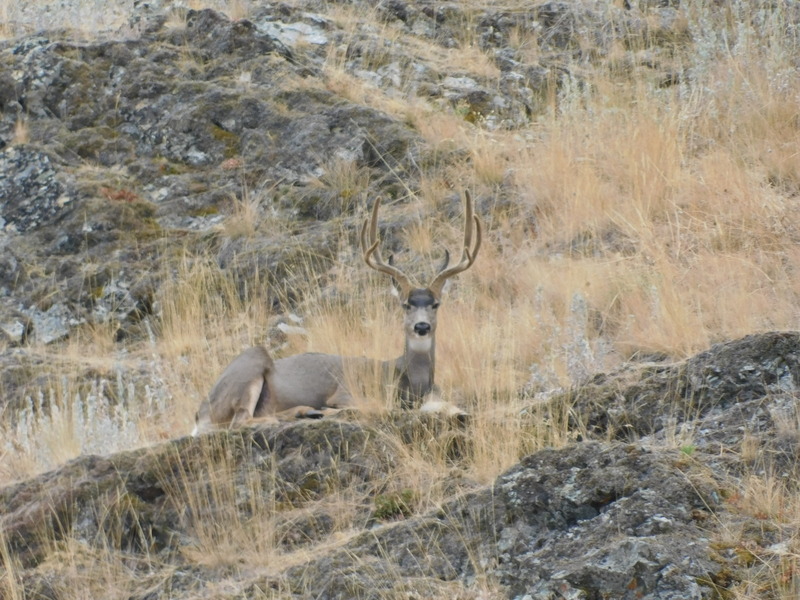 The NBR has helpful hints for how and where to photograph wildlife on the range here. -When visiting the range, take time to explore its nearby communities including Moiese, Ravalli, St. Ignatius and Charlo. 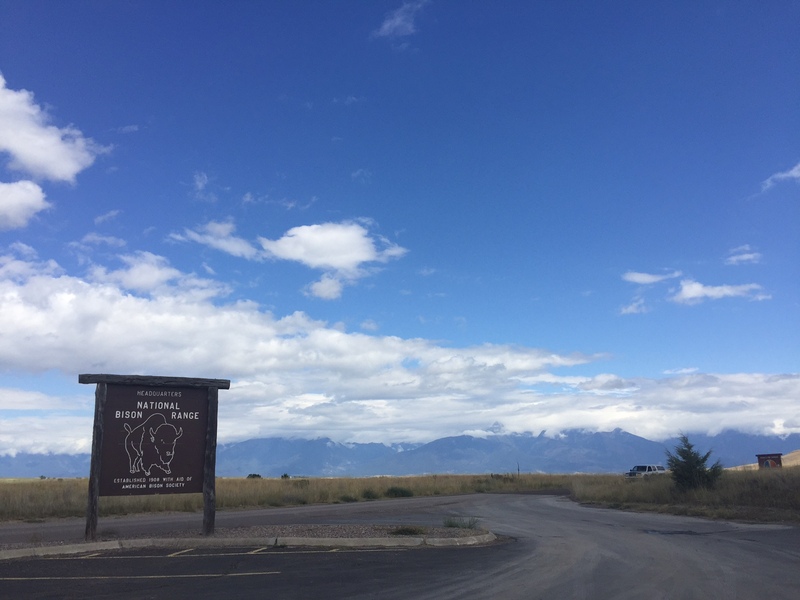 -If you’re looking to overnight near the National Bison Range (allowing for easy access to early morning views and prime wildlife-watching), check out Ninepipes Lodge near Charlo. -Front gate hours are 6:30 a.m. – 8:30 p.m.
-Cost to visit the range is $5 vehicle. 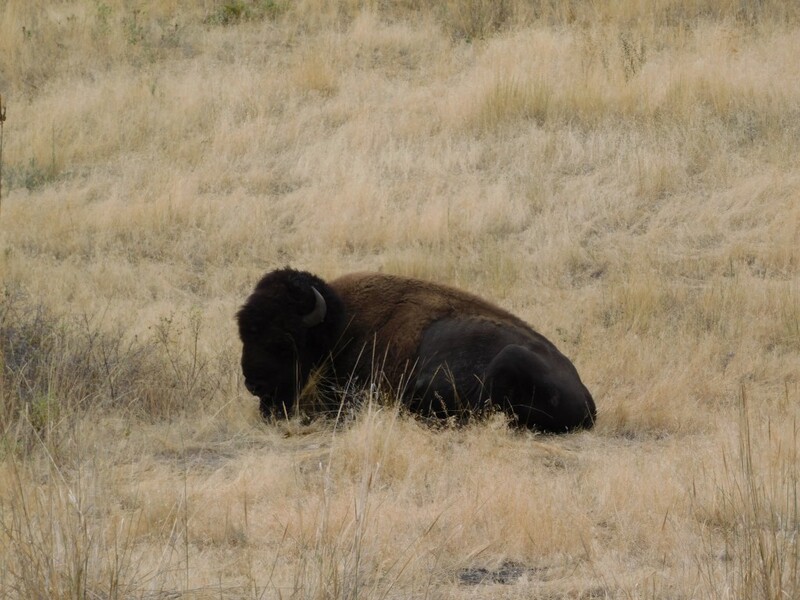 And if you need a personal guide on your visit to the National Bison Range? Call us (or actually tweet us at @GlacierMT)! 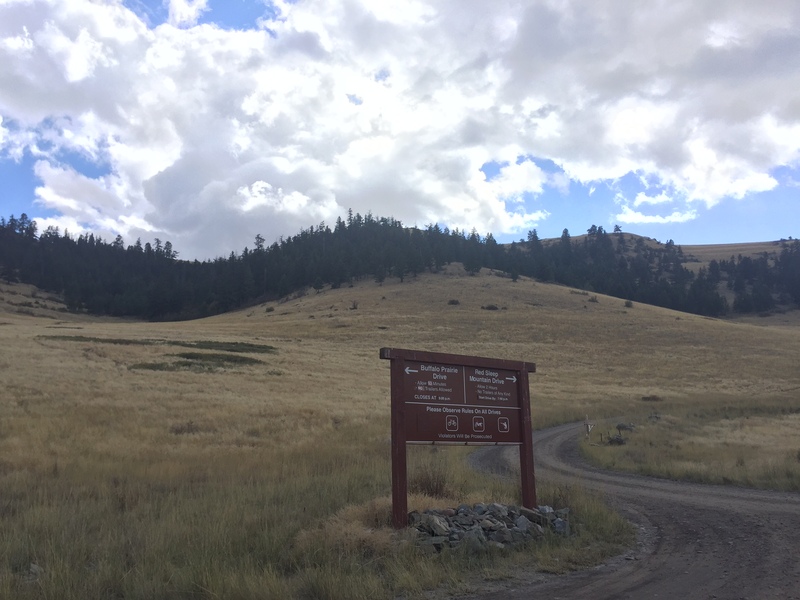 This entry was posted in Montana Fun, Outdoor Fun and tagged Fall, Mission Valley, National Bison Range, wildlife, Wildlife watching on September 23, 2016 by tiatroy. As you probably know by now, Montana is a wild place. She still holds an element of magic and mystery and is unapologetically untamed and undiscovered. And I don’t know about you, but I love her for it. After all, that’s part of her charm. As a wild place, it probably comes as no surprise that Montana is home to plentiful forms of wildlife. From the bison in Yellowstone National Park to grizzly bears and moose in Glacier National Park, Montana is a place where you can see wildlife in their element. And chances are — if you spend enough time outdoors — you will encounter wildlife. This image, taken by Montana photographer Philip Granrud, shows a hiker and a bear on the same trail, with the hiker moving off of the trail and onto a rock ledge. The backstory is that the hiker and the grizzly bear were walking toward each other on the trail and spooked each other. The hiker, thinking quickly, moved out of the path of the bear and is waiting about 10 feet below the trail for the bear to pass. Once the hiker moved out of his path, the bear moved speedily along the trail and deeper into the park (read the full story from the Missoulian), while the hiker returned to Logan Pass. 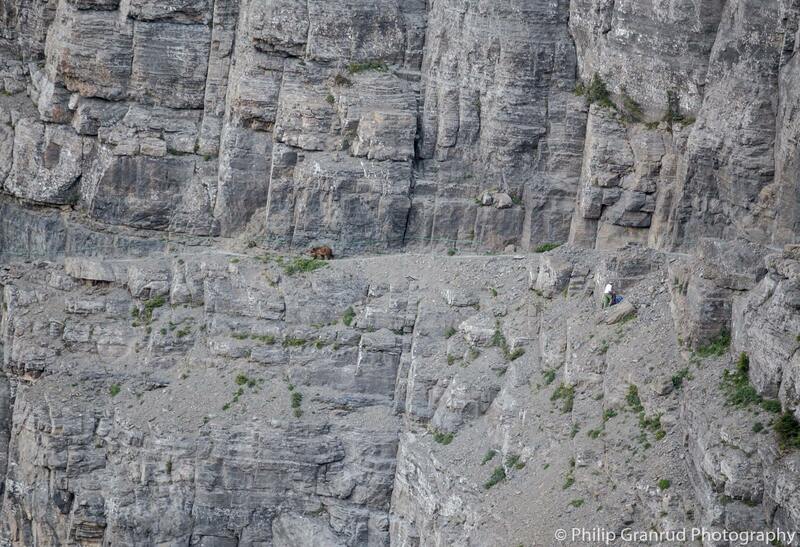 While it’s quite the story, it’s one that ended well for both the grizzly bear and the hiker. As I’ve often told friends and family that are visiting Montana, wildlife actually want to avoid us as much as we want to avoid them. This is why you often don’t see bears on trails (they don’t want to see our sweaty faces) and why rattlesnakes literally rattle to warn you that they’re nearby. Just imagine if you were a mama bear with her cubs. Would you really want a group of people in ridiculous styles of clothing (remember you’re a bear – all types of clothes are ridiculous to you) sneaking up on you when you’ve just put your little one down for a nap? My guess is no. 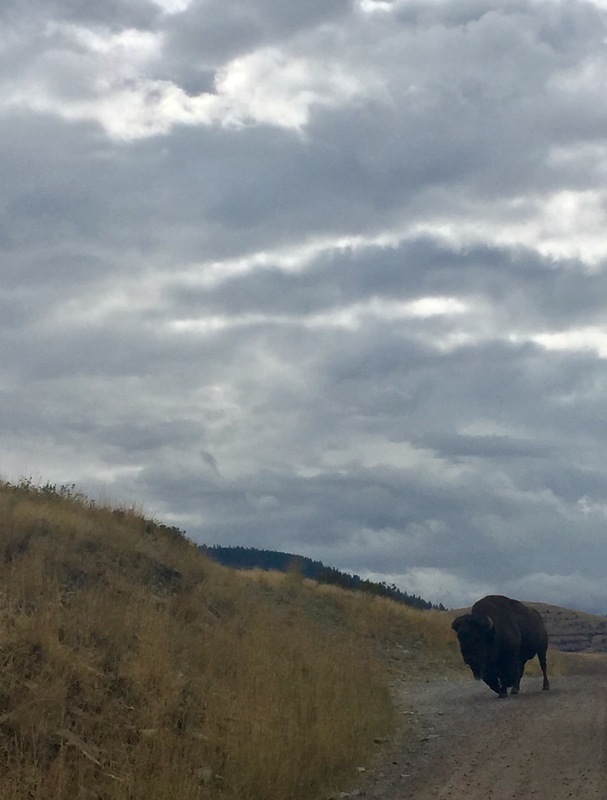 To help us all have positive encounters with Montana’s watchable wildlife, I’ve rounded up a few tips and recommendations for when you’re exploring Big Sky Country. View wildlife from your car or from a safe distance. For bears, you should stay at least 100 yards (the length of a football field) away. Do not approach wildlife. While they look cute and cuddly, remember that they are wild animals. No offense, but they don’t want to hug you. If you’re taking photos, use a telephoto lens. Do not approach wildlife for a better photo. Let them know you’re nearby. When hiking, be sure to hike in a group, carry bear spray, stay on designated trails and make noise at regular intervals. This messy-haired girl likes to sing (you’re welcome bears and humans), say “hey bear” loudly at regular intervals or clap my hands as I walk along. PS: Do us all a favor and don’t rely on bear bells as your noisemaker. Most of them are not loud enough. Be mindful of where you’re hiking. Right now bears are filling their tummies on wild huckleberries, cow parsnips and moths. Just think of it like this: You are in their kitchen. You wouldn’t go into the kitchen of someone you don’t know and just start helping yourself without making a sound, right? Nope, you wouldn’t. You’d announce yourself loudly, survey your surroundings and let them know that you were there. And if they’re there? Well, you just move along. After all, you don’t want to invade their space. Don’t mess with mama. Never feed or harass any kind of wildlife and don’t come between a mama and her baby. This applies to moose, bears, goats, deer, mountain lion, etc. Three cheers for safety (says the girl who loves being safe more than candy). 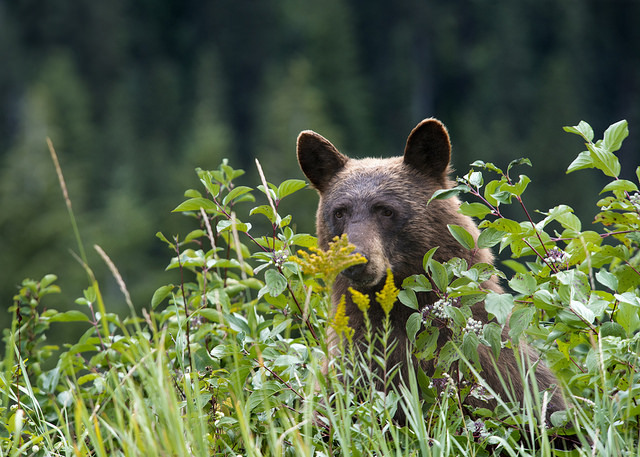 Additional safety tips for bears can be found here, while tips for viewing other wildlife can be found here. This entry was posted in Uncategorized and tagged Glacier National Park, wildlife on August 6, 2014 by tiatroy.